Our story began in 2006 when Mehdi Zarhloul left the corporate world of Four Seasons Hotels and Resorts to pursue his American dream of owning a business. The first Crazy Pita Rotisserie & Grill restaurant opened on August 16, 2006 in Las Vegas Nevada. From the time Mehdi started brewing the idea for a local Mediterranean restaurant, the goal has always been to provide guests with flavorful cuisine inspired by Moroccan spices in a friendly and welcoming environment. 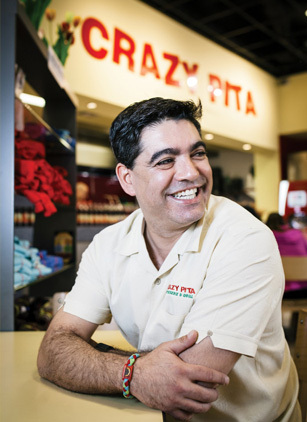 Crazy Pita values authenticity, diversity, and the unwavering dedication to exceeding guest expectations that can come only from truly kind and honorable people working to help guests feel at home while enjoying a fulfilling experience. Signature dishes at Crazy Pita Rotisserie & Grill feature food that is prepared from scratch and grilled to order. We maintain our high standards of quality by crafting authentic and delectable entries with fresh meats and a variety of vegetables. Chicken, steak, lamb, shrimp, salmon, kefta, falafel and vegetable skewers are served either as pita sandwiches, main plates, or rice bowls. We also offer a variety of fresh salads and fresh marinated rotisserie chicken. 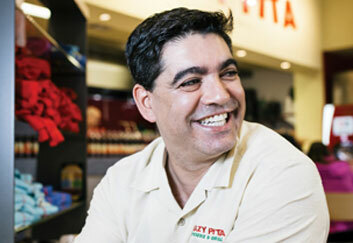 Our Crazy Pita restaurants are a community driven concept. We engage with our loyal customers via several community activities including school fundraisers, non-profit donation drives, and community food and beverage tasting events. "Our mission is to provide the freshest quality Mediterranean food with uncompromising professional and friendly service." 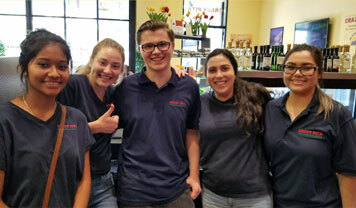 people - Crazy Pita Rotisserie & Grill is dedicated to improving the lives of individuals in our communities through commitment to community involvement and through professional and personal development of our team members. We place a high value on integrity in the workplace and we take pride in honest relationships with our guests, team members, and purveyors. 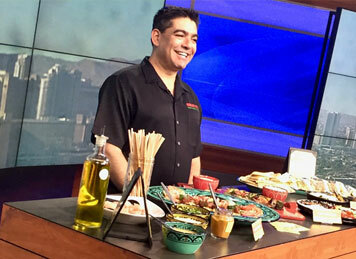 product - Crazy Pita Rotisserie & Grill guarantees fresh Mediterranean cuisine and exceptional guest service. We strive to provide our guests with the highest quality products available in the market through a friendly and welcoming atmosphere. profit - With our exceptional service and the premium quality of product we offer, our loyal clientele find our products and services valuable and worthy of expenditure. It is our responsibility to continue to offer value by exceeding guest expectations. This is what allows us to earn a profit and continue to operate our restaurants successfully. At the present time, we are not registered in any of the following states, and therefore, do not and cannot solicit franchise sales in or direct offers to these states: California, Hawaii, Illinois, Indiana, Maryland, Michigan, Minnesota, New York, North Dakota, Rhode Island, South Dakota, Virginia, Washington and Wisconsin.